Former prime minister and prominent opposition activist Jan Olszewski has died aged 88 in a Warsaw military hospital. Olszewski, who served as the country’s third post-communist prime minister, passed away, according to press reports, from a stroke after collapsing at his home. Paying respects to Olszewski Beata Szydło, herself a former prime minister, described him as a “wonderful man who was always on the side of the weakest and the abused”. Born in the capital in 1930, Olszewski studied law at Warsaw University but after a short stint at the justice ministry he moved into journalism. As a journalist working in the 1950s he took the bold step of calling for the rehabilitation of Home Army soldiers, many of whom had faced persecution by the communist authorities in the post-war years. Their treatment was a taboo subject at the time and Olszewski’s stance helped hasten the demise of ‘Po prostu’, the magazine he was working for, at the hands of the state. The backlash against him and magazine also helped move into opposition circles. Returning to law he rose to prominence defending opposition activists in a number of trials during the 1960s, which led to the authorities banning him from legal practice for two years in 1968. Over the next 10 years Olszewski rose in importance in opposition ranks, joining Solidarity in 1980, and working as an advisor to Lech Wałęsa. He was also part of the Round Table discussions to end communist rule, which took place 30 years ago. 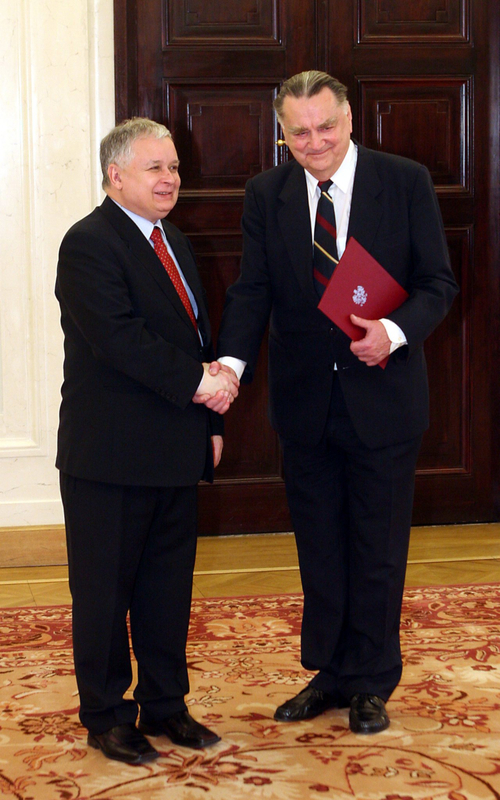 Olszewski became prime minister in December 1991 when Lech Wałęsa, then president, appointed him to the post, and on December 23 his government received the vote of confidence from the lower house of parliament. Olszewski represented the Centre Agreement party, the first political block formed by Jarosław Kaczyński, the current leader of Law and Justice. But his term as prime minister lasted just five months. His relationship with Wałęsa, which had not been good when he took office, worsened as the two men clashed over control of foreign and defence policy. His government was also embroiled in controversy over the extent of the de-communisation in the state, and on the night of June 5, 1992 his government lost a no confidence vote and Olszewski lost his post as prime minister. Olszewski continued in active politics until 2006, and later worked as an advisor to President Lech Kaczyński, until the president’s death in the Smolensk air disaster in 2010.